The success of the SkillsUSA Wisconsin Program of Work for any year depends largely upon the strength of its student leaders. Strong student officers begin with high quality candidates and the local selection process is key in assuring the quality of the candidates. For more information about becoming a Wisconsin State Officer, please read below and through the State Officer Candidacy Packet 2019. 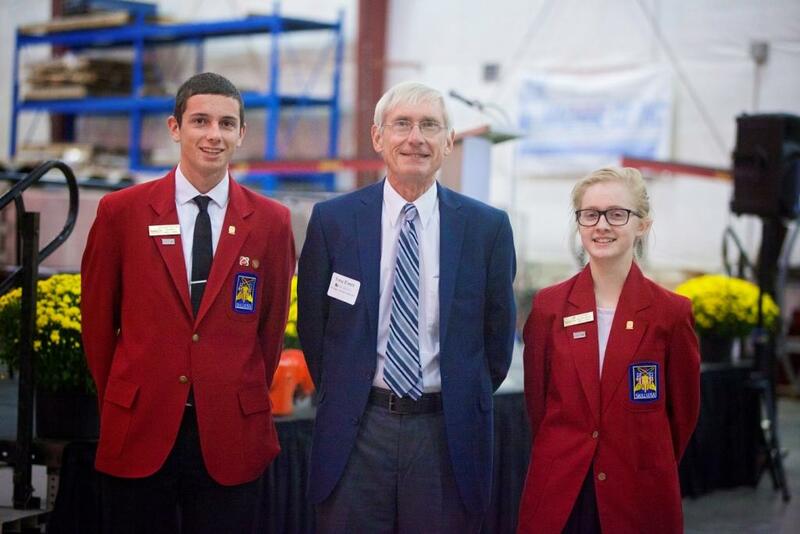 Jonah and Lilly with State Superintendent Dr. Tony Evers, representing SkillsUSA at a manufacturing event. All candidates for State SkillsUSA office as well as advisors, administrators and especially parents / guardians must be aware that State SkillsUSA officers participate in numerous statewide activities which require travel of an hour or more from home. The officer team is encouraged to work together to car-pool to / from events, however often times officers will need assistance from parents / guardians or advisors to get to/from events and activities. All parties concerned must be aware of this aspect of service and be willing to assist the student officer with transportation.